It may be a bit too hasty to call the end of the ‘Cold Trade War’ after the US and EU agreed to take steps towards freer bilateral trade between the two nations – not least because talk is cheap and there’s a precedent for this White House to renege on any trade peace offerings (China a case in point). But for risky assets, averting an imminent global trade war was probably the best possible outcome that the Trump-Juncker showdown could deliver. Earlier this summer, we noted how the US dollar had been the big winner of the Trade War Trap that has been plaguing global markets – so it’s not all too surprising to see the currency lower across the board on the back of easing global trade war risks (note USD crosses were trading at a 2-3% premium relative to interest rate differentials and global risk sentiment – and this is now starting to unwind). But this is merely the icing on the cake when it comes to our call that the USD rally has topped out; fading positive US data surprises, the markets’ extreme switch from short to long USD positions, the fizzling rally in short-term US rates and the president’s jawboning were already good enough reasons to see the USD rally briefly turn on its head. In fact, we look for the distortedly high 2Q18 US GDP print tomorrow to end the markets’ love for the US dollar – as investors turn their attention to a potentially weaker US economy in the second half (note possible emergency support for US farmers and weaker industrial earnings shows how Trump’s tariff policies are starting to bite). While risky currencies may enjoy a bit of short-term relief, caution is likely to prevail; as we said, it’s too early to declare this as a friendly shift in US trade policy. We may need to see actual steps towards trade reconciliation – such as an exemption in EU steel and aluminium tariffs and the US Commerce Department dropping its Section 232 investigation into prospective auto tariffs. Plus, let’s not forget that Trump is still fighting trade wars on two other fronts (China and Nafta). Still, as they say, make hay while the sun still shines. If ECB President Mario Draghi had the option to just replay the June press conference today, then we’re pretty sure he would take it. Our economists believe that with little new developments since last month, the ECB chief will resort to reiterating the key messages of the June meeting – especially the prior forward guidance that interest rates will stay unchanged ‘at least through the summer of 2019’. There may be some pressure on the ECB to clarify the meaning of ‘summer’ – yet it’s worth noting that the clever wording here gives policymakers the necessary flexibility to adjust policy rates as and when the economic data dictates. 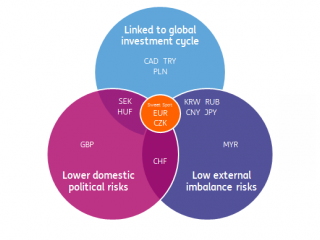 While market expectations have shifted too much towards the dovish side of things for our liking – with only 10 basis points worth of ECB deposit rate hikes priced in by the end of 2019 versus our house view of 40 basis points – we doubt Draghi today will be the catalyst for short-term eurozone rates to move higher (particularly as the spectre of US auto tariffs still looms large). Equally, however, the bearish adjustment in euro positioning in recent months – with leveraged funds now the most bearish they’ve been on EUR/USD since the French presidential elections in May 2017 – means that there’s probably limited scope for a dovish Draghi to weigh on the euro. Bottom line is that we expect a fairly boring ECB meeting to keep EUR/USD rooted above 1.17 (see our Crib Sheet for some useful alternative scenarios).